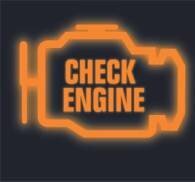 Everyone dreads the Malfunction Indicator Lamp (MIL), or more commonly known as the "Check Engine" light. This light was created by manufacturers and Society of Automotive Engineers to inform people of a system malfunction which causes poor emissions and driveability problems. Or, sometimes you feel driveability problems without the light coming on. Our technicians, with their combinations of certifications, can diagnose and repair all driveability problems.